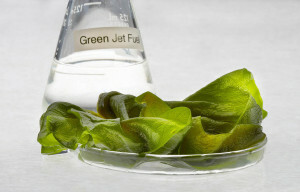 Jet fuel from algae! Will the wonders of #SciFund science every cease? I am incredibly excited to announce that a new scientific study partially funded through SciFund Challenge crowdfunding has been published. Dr. Stephen Herbert is a professor in the Department of Plant Science at the University of Wyoming. He was also part of our very first round of science crowdfunding, way back in November 2011. His crowdfunded research has just been published in the Journal of Applied Phycology. His research focuses on environmentally-friendly fuel – in particular, fuel made from algae. Algae might just be the ultimate renewable resource. There are lots of issues to be solved though before algae-fuel ends up at your local gas station. One problem is that large-scale harvesting of algae for fuel is still very expensive. In the research that was just published, Dr. Herbert – and his co-author Dr. Levi Lowder – detail a new method of genetic engineering for algae that shows huge promise for bringing those harvesting costs down. You can check out the paper in the Journal of Applied Phycology here. A bunch of SciFund-supported research papers have been published and you can see the full list here. And definitely take a look at Dr. Herbert’s crowdfunding video back from 2011!